Got questions about ordering a singing telegram? Peruse our FAQ here. All telegrams are delivered in costume, unless otherwise requested. Makeup or elaborate costumes cost more. We happily accept cash, checks, credit cards, PayPal, Venmo, Cash (the app) and Zelle. Tips are immensely appreciated. Occasional discounts are available for customers who permit performances to be filmed for documentary purposes. Rates may vary depending on character, occasion (Valentine’s is our busiest day of the year, so rates may reflect that) and singer availability. If an agreed upon performer becomes somehow unavailable following booking, a suitable replacement will be found or a refund will be offered. Singing telegrams? I thought those only happened in movies. Delivering singing telegrams is a niche business to be certain. Some people might not get a single singing telegram in their entire life. Some get one on their first or second birthday. Just because you've only ever seen one in a movie doesn't mean they don't happen somewhere nearly every day. I've never ordered a singing telegram before, how does this work? We work with plenty of first-time customers. If you are emailing or texting us an inquiry, the first details we like to know are the date and the approximate location. Some customers know exactly what they want, and others need guidance. 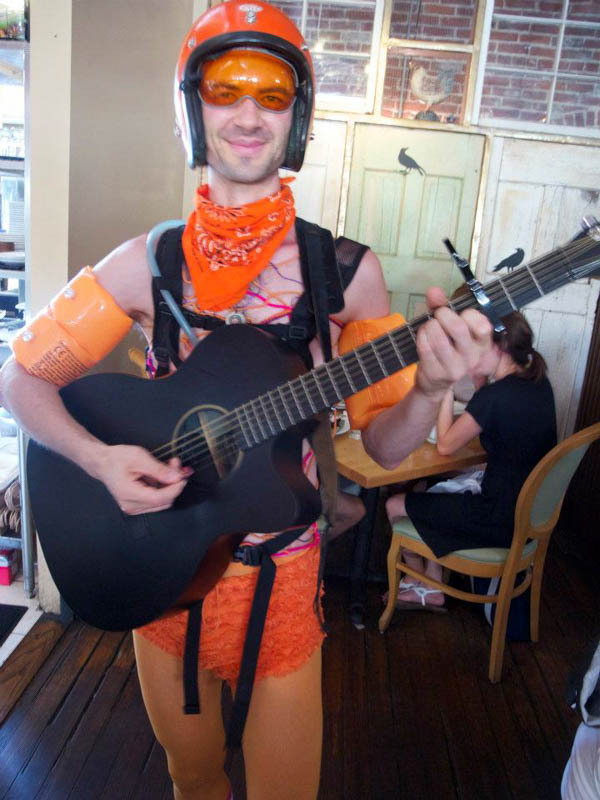 Start by browsing our song suggestions and costume gallery. We're happy to help if you need us. What is your most popular costume? Gorilla in a tutu. It's a classic singing telegram costume - people will likely always get joy from seeing animals in human clothes. What is the most popular song you perform? Are there other song options besides the suggested ones? We love learning new songs, especially if there's a perfect one for your event. Whether we can learn a new tune in the time allotted depends on the degree of difficulty, but we will certainly do our best. Custom Singing Telegrams founder George Peele has been playing acoustic guitar off and on for over 20 years. Not every singer on our roster plays guitar, but a few do. Several play ukulele. One even plays a mean kazoo. We love personalizing lyrics. George Peele has been writing lyrics for 20 years. Personalizing lyrics is the best-case-scenario, in our opinion. Do you have both male and female singers available? While founder George Peele performs the majority of singing telegrams we book, we work with a number of talented local singers of both genders. Melissa, one of our favorite female singers, accompanied Peele on two Valentine's Day-related TV appearances. Peruse the Press section of this site (in the Media drop down menu) to see for yourself. We definitely deliver gifts. The most common requests are balloons, flowers or candy, but we'll occasionally deliver cakes or other gifts. Considering this question is included in our frequently asked list, you're not the first person to inquire about a last minute singing telegram. Schedule-permitting, we try to fulfill same day requests as often as possible. If you are inquiring at the eleventh hour, please note that calling (or texting) generally nets you a faster response. Can someone film my singing telegram? We are happy to try and book a videographer to capture your singing telegram. Do you book other kinds of performers (aside from singing telegrams)? We know lots of performers and are happy to help you book different kinds of talent. Check out the Citric Acid Arts page for further information. Cash, check, credit card, Paypal, Venmo or the Cash app. If George Peele is your singer and you're going to be present for the performance, you're welcome to pay before or after in cash. If you can't be there (or Peele isn't your singer), check, credit card, Paypal or Venmo are your best options. Checks can be mailed to: Custom Singing Telegrams c/o George Peele PO Box 6058., Denver CO 80206. For Paypal, just log on to Paypal.com and click "Send Money." Our Paypal email is yello@orangepeelmoses.com We usually handle credit card transactions over the phone. Our Venmo handle is @orangepeelmoses. We generally collect the base payment in advance, and some customers prefer to tip in advance (though tipping afterward is understandably common too). Although we've definitely gotten far more in certain instances, we often get at least 20% to 25%. How did you get into doing singing telegrams? I remember envisioning delivering singing telegrams when I was 17 or 18, just a few years after I began first writing original songs. Even though I'd seen Ferris Bueller's Day Off many times, I failed to connect what I was picturing to the balloon bouquet-wielding nurse that mistakenly performs for Bueller's sister. Years later, I met a belly dancer who occasionally did “belly grams” for a singing telegram agency. Bachelor parties and Middle Eastern families were her primary demographic. I badly needed a job at the time so I called the agency's owner. At that point, I'd been singing, playing guitar, writing lyrics and collecting costumes for years, so I already had the perfect skill set and assets. Singing telegrams isn't my only gig, but it is my primary one (I'm also a stilt performer, an event emcee and a freelance writer). I currently do 35 telegrams in an average month and I did over 50 (14 on Valentine's Day alone) in my busiest month to date. I think Denver may be one of the best cities for singing telegrams, as it's big enough for a respectable customer base, but not so big that it takes multiple hours to traverse it. Is delivering singing telegrams fun? While there are certainly occasional downsides, ambushing people with music and costumes and gifts is generally a blast. What's the craziest or funniest singing telegram you've ever done? I get asked this question a lot. In my ten plus year tenure, I've delivered over 3000 singing telegrams. So there have been plenty of “crazy” ones. One of my favorites was the time I sang to a guy who'd recently had a vasectomy. At his office. In a hot dog costume. I also recently did Iggy Azaela's “Fancy” at an assisted living facility staff meeting in a burlesque cockroach costume. I could go on.